Luxury is about the experience, not the price tag. 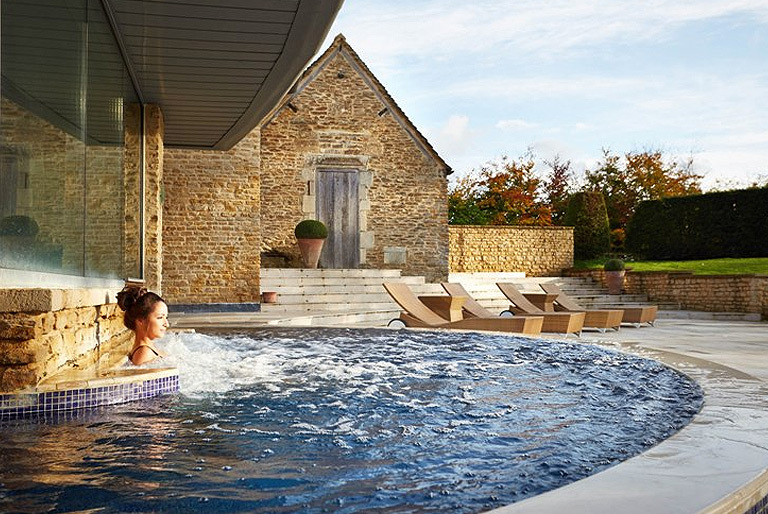 The list of facilities at Whatley Manor’s Aquarias Spa is a long one, considering the property’s idyllic but isolated location in the rolling Cotswolds and the mere fifteen rooms and eight suites that accommodate the guests. 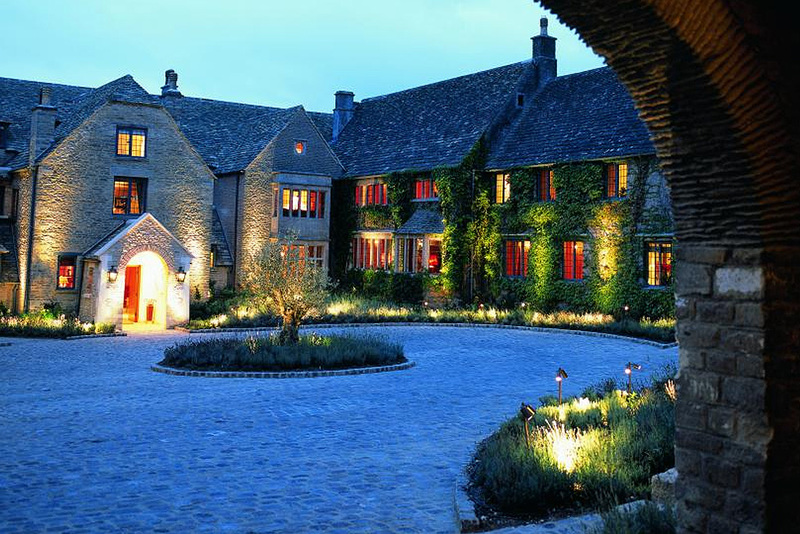 However, Whatley Manor’s proximity to Bath and Cirencester, as well as the many surrounding affluent villages, make this a picturesque retreat for a day of pampering, even for those who do not stay overnight. At the time of my visit, a rather chilly spring weekend, there were perhaps two or three pairs of clients in the spa at the same time, giving everyone plenty of privacy and personal space to enjoy the facilities. With spa treatments booked and plenty of time to spare, we changed into bathing suits, soft white bathrobes and slippers and headed down to explore. 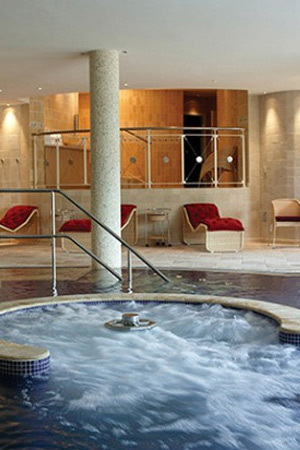 The spa is located on the basement level of the Manor house, which becomes the ground level at the rear of the property, allowing for a seamless swim-through from the indoor hydrotherapy circuit, with airbeds and airtub, to the outdoor pool with its high powered massage jets. You enter through the Spa Lounge, which serves light lunches, juice drinks and other refreshments to guests, spa clients and members of the attached gym. There are several thermal cabins, including a traditional sauna, a gently warming laconium, a deliciously perfumed camomile steam grotto, a sweat-inducing calidaruim. After a quick shower, we began in the laconium, gradually acclimatising to the heat, before stepping (briefly) into the other thermal rooms, where even the lights have been adjusted for maximum relaxation potential. We then took a dip in the pool which, rather than having the hydrotherapy elements added as an afterthought, had been designed as a series of carefully timed experiences, from bubbles that surround you on a submerged bed, to a series of jets along the outdoor pool, each of which targets a different area of the body as you stand beside it. In preparation for our spa treatments, we headed to the salt scrub showers to clean off the pool water. After helping ourselves to a wooden bowl of salt each, we stepped into adjoining cubicles and proceeded to make the kind of noises that are only appropriate in public when voiced at a spa. It was divine to feel such effective cleansing and we were so impressed that we spent the whole evening remarking, “My skin feels so soft!” and returned to have another scrub before check out in the morning. 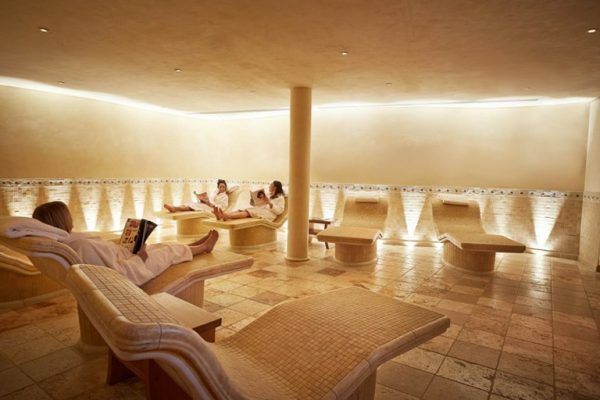 We had been instructed to meet our therapists in the tepidarium, where there were two rows of heated stone recliners, each shaped to perfectly accommodate a snoozing spa enthusiast. Those seeking additional relaxation could use the intimate Wave Dream Sensory Room, in which a pool of water reflects colourful lights across the walls, providing the perfect meditative space. My therapist was Christine, who came and introduced herself, then showed me to her treatment room a naturally lit, wood panelled room with a fresh clean scent. Having already filled in the necessary forms on arrival, we immediately began to discuss my skin type and usual routine. The treatment was a La Prairie Beauty Express Facial as Aquarias is recognised as a La Prairie ‘Art of Beauty’ centre and offers signature La Prairie treatments. Christine was very professional and friendly, explaining each of the products as we went along, including La Prairie Cellular Refining Lotion, Purifiying Cream Cleanser and Essential Exfoliant. 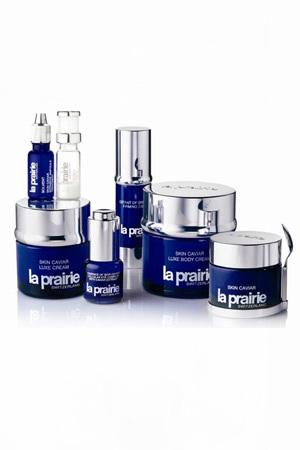 She also used some fantastic smelling La Prairie Skin Caviar products, including the Luxe Cream to moisturise and the Crystalline Concentre Serum to help restore firmness and elasticity. While the products soaked into my skin, she used cranial pressure point massage to further encourage circulation, sending me into a blissful trance. After the facial, my skin was refreshed and radiant and, since the treatment coincided perfectly with the first few sunny days of spring, it made me feel that the grey dullness of winter was finally over! Charlotte’s treatment was completely different, an Ananda Face Therapy facial using ila products, part of the ‘Beyond Organic’ treatments offered with ila at Aquarias. This facial is designed to help relieve tension, using special techniques to increase energy flow and provide a healing and nurturing experience. Describing the Ananda Face Therapy afterwards, Charlotte said her therapist, Kelly, had made her feel perfectly relaxed, as though all her stresses were being gently smoothed away. 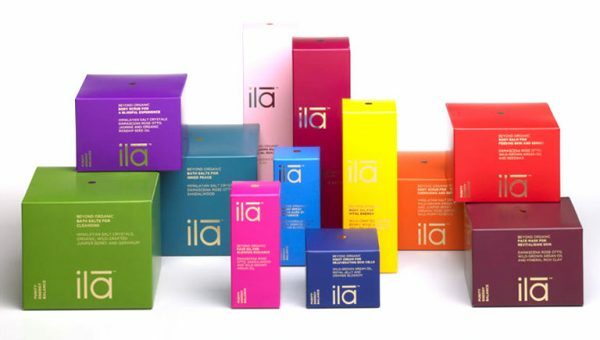 The products used included ila’s Face Oil for Glowing Radiance, Energy Spray for an Aura of Confidence and Face Mask for Revitalising Skin. 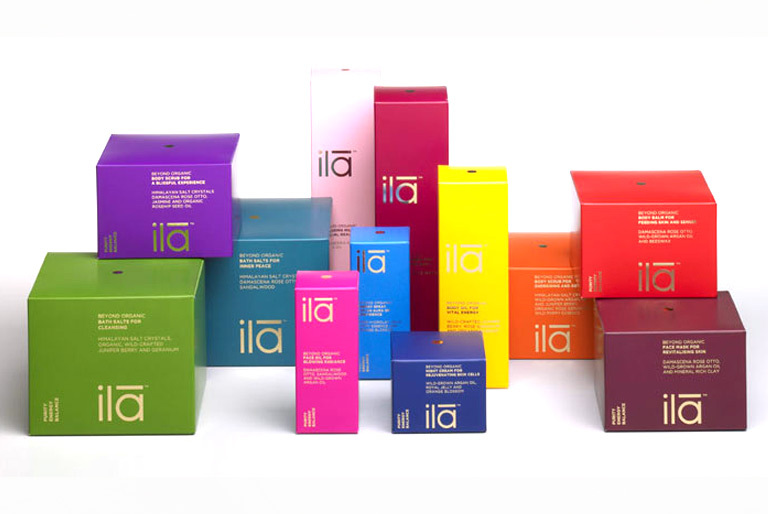 sing ila’s holistic approach, even the CD (‘Dream Time’) and scented candle (‘Tuberose and Rose – for Inner Peace’) were carefully considered parts of the experience. After the luxury of the various ila products, Charlotte reported that her skin felt impossibly soft and smooth, as well as having a delicate rose fragrance. With the last two winners of ila Therapist of the Year working at Aquarias, it is no surprise that this treatment was everything that a facial should be, and more! I could go on listing the luxurious facilities at Aquarias Spa. I have not yet mentioned the VIP Suite, the mud chamber or the revolutionary Iyashi Dôme. 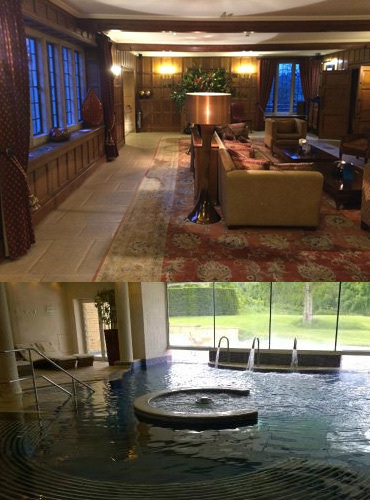 However, with Whatley Manor located less than two hours from London, and within easy reach of transport links to the rest of the country, I would definitely recommend that you discover some of the secrets of this excellent spa for yourself. The Bespoke Black Book is an independent and unbiased online lifestyle publication. For us luxury is about the experience, not the price tag.